CASTLEGAR, BC – The Waneta Terrestrial Compensation Program (WTCP) is beginning its final application intake as it enters year seven of a mandate to support habitat restoration and conservation activities in the Waneta area. A commitment arising from the construction of the Waneta Expansion Project south of Trail by project partners Fortis Inc., Columbia Power Corporation and Columbia Basin Trust, the program has to date distributed $300,000 to 32 projects that highlight the unique ecosystem of the Pend Oreille/Lower Columbia. Butterfly and pollinator inventories, research on threatened bird and reptile species and rare plant studies are some of the activities that have taken place since the program began in 2012. Work supported by the WTCP has resulted in extra-ordinary findings. 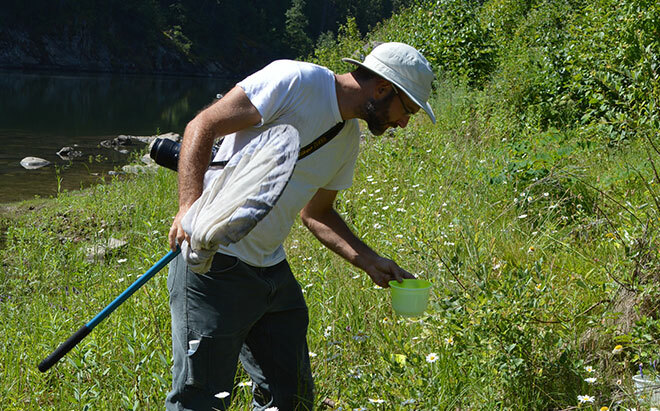 Research this summer by bee specialist Lincoln Best to catalogue bee species led to the discovery of bees from the family, Melittidae, the first time this family has been officially documented in BC. Eligible activities under the Waneta Terrestrial Compensation Program Terms of Reference include research, physical works, and other on-the-ground or applied projects and may include educational programs, development of management plans, inventories, habitat creation (restoration, rehabilitation), weed control, habitat protection and land acquisition. Applications for the 2018 intake will be accepted until January 31, 2018 with up to $50,000 awarded to successful projects. Visit columbiapower.org/WTCP for an application form and more information.